She is known for being a great catalyst for this generation. Since the inception of the genre, Gospel Music has become synonymous with many things; anointing, power, inspiration, deliverance, and healing. Throughout the generations, the word of God in song has also been synonymous with dynamic child prodigies that encompass all of the above. Legends Shirley Caesar, Aretha Franklin, Sam Cooke all began their prolific careers as young children, and the effects of their ministries continue to resonate to this day. Stellar Award-winner, Jekalyn Carr, is next in line to be recorded as the most dynamic young Gospel singer of her time. Carr literally burst onto the scene in 2013 with the poignant and powerful Billboard Top 5 single, “Greater Is Coming,” as an independent artist, which showcased a vocal ability and intensity far beyond her 15 years. “Greater Is Coming” captured the attention of Gospel listeners across the country and positioned Carr to take her rightful place on the national stage. Since her debut, Carr has wowed audiences with her dynamic singing and preaching, with two nationally distributed albums already under her belt. Now 18 years old, Carr is prepping her latest release, entitled The Life Project, a powerful collection of songs, not unlike what fans have grown accustomed to expect from Carr. The voice that captivated the nation, now powered with even more life experience and ever-evolving insight, is back, bigger and bolder than ever before! 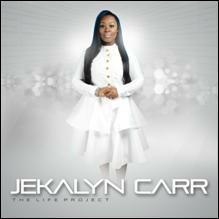 The Life Project is Carr’s first live recording and captures her in her full element as a singer and evangelist. As compelling as she is as a vocalist, she is equally as dynamic as a preacher. The Life Project creates an atmosphere that allows her to flow seamlessly, back and forth, between the two resulting in an unforgettable worship experience.